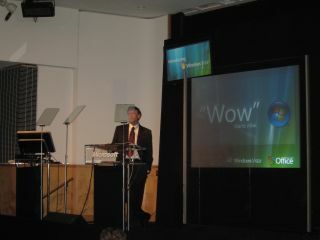 Bill Gates hailed the strength of the Windows ecosystem during his speech to launch Windows Vista in the UK. The presentation took place in the Conference Centre at the British Library, where around 200 journalists and camera crews waited to watch Gates speak, fresh off the plane from the New York launch. It kicked off with a bunch of flashy screenshots of Vista and Office 2007 set to unbearably loud guitars while other screens showed the 'Wow starts now' slogan. Gordon Frazer, MD of Microsoft UK, introduced Gates. The Feeling are also due to make an appearance. Gates was supposed to start at 10am GMT, but clearly he got held up by the BA aborted strike. Frazer told us "we're here to celebrate innovation...if there's a single word to sum up today's releases, that word is wow... It's about putting the 'wow' in your everyday life." Gates took us back to the launch of Windows 1.0 in 1983 and then told us about the 'major milestone' of Windows 95 alongside the simultaneous Office release - happening today for the first time since then. "People were simply thinking about creating and printing documents then." He talked about how the internet had changed things since Windows 95 before hailing Windows Vista as a remarkable new release. "With Windows Vista, we have the foundation to take things to a whole new level. It's about the Windows Workstyle and the Windows Lifestyle"
He talked to taking entertainment to a whole new level: "The revolution of television [alongside] games with a new level of realism." There's a lot about safety...we have a big first with Parental Control. Gates told an anecdote about his son's now-restricted use of the PC. "Safety has been a huge element of the investment we've made here." Gates also hailed the connectivity improvements in Vista: "There's a lot of plumbing in here for VoIP and video." He spoke about how Vista enables you to "mix your photos and movies...Movie Maker includes High Definition editing. There's a rich set of things built into Vista." Moving on, Gates said "Office 2007 [is] a major, major release embracing the XML standard." "The ribbon interface...brings things to the surface... Giving people more power and letting them create what we call 21st Century documents." "Over 20 million people have used these products. We have a very special family orientated programme with 50 families. There were around 800 fixes and changes made [as a result]"
"The strength of Windows has always been the ecosystem around it. Every time we move the platform up to a new level, we're amazed at what [is] done with it. He talked of the gadgets created for the Windows Sidebar and joked about a gambling gadget that would be "very popular here." Gates then moved on to announce a digital partnership with the British Library - we'll be posting more details about it in due course.